It's spring break in Texas and the kiddos and I have some FUN plans this week! My planned post for today is stuck on my I-Phone and I'm too tired (thank you, Daylight Savings Time) to figure it out! So...I'm changing it up this morning!! (and red, white, and blue matching day apparently). 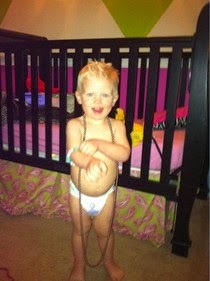 Nixon was enjoying playing dress-up as an almost two-year-old. He'll be SO proud of this picture when he's older, right? On this day, when Nixon woke up from his nap Ebby Lee wanted to join him in the crib for some play time. I snappe some CUTE pictures. Nixon's little face melts my heart!!! My worst preggo look EVER!!! 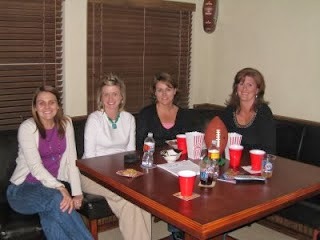 I posted about our Super Bowl party (about a month late). I remember doing a LOT of eating that year! haha! And...after those pictures who do you think this guy looks like??? His big brother or his big sister??? Oh goodness! I think they all favor each other but I don't know if any two of them look just a like! They all look like siblings...but they all have their own little looks at the same time. When I see Bowen and Nixon, I see Tab's family and when I see Ebby Lee, I see your side. All three cuties!! I can't get over Baby Ebby Lee. What a sweetheart! I totally think that Bowen has your eyes but he favors Nixon. They all are so precious!!! SO cute! I think Bowen looks more like Nixon but at the same time I think they all have their own sweet looks that make them all so different! Fun looking back! I agree with Shay! I used to think he looked like Nixon, but now I think he's totally his own "look". They're all so stinkin' cute! And I can't get over baby Ebby Lee!!! You seem like so much fun to hang out with! :) Your kids are so adorable. Bowen looks a little like both of them. So sweet :)! !